Advanced multi-functional formula. Fulfills the requirements of both domestic and foreign high performance motorcycles, ATV's, snowmobiles, Marine, Watercraft and lawn & Garden equiptment. Recommended for both liquid or air-cooled 4-stroke engines as well as all 2&4-stroke motorcycle transmissions. 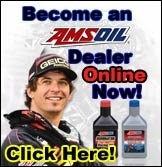 Amsoil synthetic 4 stroke oil & small engine oil. AMSOIL Formula 4-Stroke® Power Sports 0W-40 Synthetic Motor Oil is specially formulated for ATVs, snowmobiles and other power sports applications. Its broad viscosity range and wax-free formulation make it excellent for use in both hot and cold temperature extremes. AMSOIL Formula 4-Stroke® Marine Synthetic 10W-30 (WCT) Motor Oil is FC-W registered and warranty certified for use in four-stroke outboard motors. It surpasses the FC-W four-stroke outboard motor performance requirements established by the National Marine Manufacturers Association (NMMA) and are recommended for gasoline-fueled four-stroke outboard, inboard, stern drives (inboard/outboards) and personal watercraft motors.